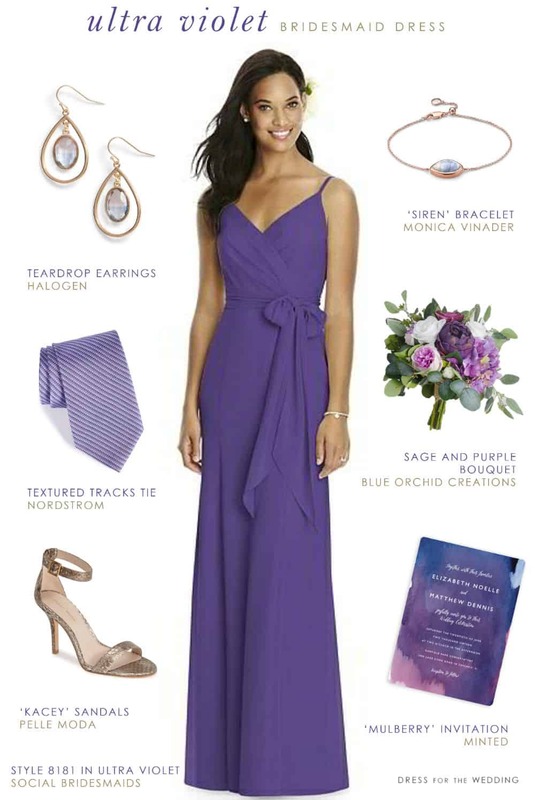 This bridesmaid outfit idea shows off the Pantone Color of the Year for 2018 as imagined for wedding party attire – here’s a bit of inspiration for Ultra Violet Bridesmaid Dresses! As a you may have heard, earlier this week Pantone announced their much-awaited pick for color of the year for 2018: Ultra Violet 18-3838. Sounds like this color is multi-faceted; peaceful, innovative, and inspirational! The color of the year and Pantone colors in general are also always big for wedding inspiration! The wedding world has welcomed Ultra Violet with a few mixed reviews, mainly because another purple – Radiant Orchid – was heavily featured quite recently. But as time has shown, wedding pros will soon find ways of working the color into weddings in ingenious ways that are sure to make you see all the possibilities in this indigo-meets-purple color! While ultra violet was a little hard for me to find in some of the purple dresses in stock in department stores for the current season, Dessy Bridesmaids, always specializes in having a full rainbow of hues for bridesmaid dresses, (at last count they offer over 120 colors in some styles!) They certainly do not disappoint when it comes to Ultra Violet bridesmaid dresses – because Dessy always features Pantone color matches, so they offer Ultra Violet dresses in several designer bridesmaid dress lines, and in every silhouette, size, neckline, and fabric in the exact color Pantone recommends. Ultra Violet bridesmaid dresses are easy to find when you take a look at their amazing selection. Today’s featured bridesmaid outfit inspiration is a dress from Dessy’s collection, Social Bridesmaids Style 8181 in a beautiful wrap style! See all of Dessy’s Ultra Violet Pantone wedding accessories and bridesmaid dresses. What Colors Go with Ultra Violet? Whether you make ultra violet a focal point of your wedding, or use it as an accent color, it actually has quite a range of hues that it looks great with! It’s a vibrant color that can stand up to other bright shades, or it can take an even more sophisticated style when paired with metallics. 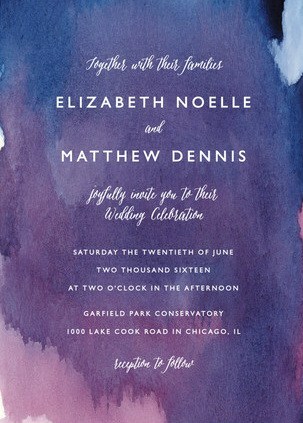 This invitation: “Mulberry” – Customizable Wedding Invitations in Purple by Lindsay Megahed from Minted has some great colors to pull from for ultra violet wedding inspiration! Ultra Violet is also a great color in florals. Many purple flowers like irises, some shades of hydrangeas, orchids, and stock are available in this vibrant purple shade. Whether you coordinate with Ultra Violet or use it as contrast, I think you’ll be loving this color by the time 2018 gets into full swing! If you’re looking for bridesmaid dresses in Ultra Violet, check out the selection of styles from Dessy. Also take a look coordinating ties they offer! You won’t be disappointed!